As I walked to the grocery store one day in Nairobi, Kenya, in 2013, I ran across some of the street boys who I had been ministering to for about a year by then. In the course of our conversation my little friend, Victor, asked if I would buy him some yogurt, a coveted treat for the street kids, besides bread and milk. After completing my shopping and returning to Victor with his yogurt, I was surprised to find he was no longer there. An unusual occurrence when yogurt is on the way. Instead there was a boy who looked to be about 10 yrs. old whom I’d not seen on the streets before. He informed me that Victor had returned to the town of Kawangware, where the street boys’ “base” is, the place where they sleep in little sheet metal houses. It’s about a mile walk to there. Victor’s departure made this new boy the lucky recipient of his yogurt. The boy told me his name was Melckzedeck, like Melchizedeck in the Bible. I thought that was neat because I had been listening to scriptures that day which talked about Melckizedeck, and “how great he was.” When I asked him if he wanted to come off of the streets and go to school he said that he did. I told him to be at that same spot at 6pm that evening as I would be coming back that way. Sure enough, he was there at 6pm. Over the next 2 weeks I looked hard for a long-term place for him to stay, researched his background, and every day or 2 bought him enough food to keep him from having to beg. He had found a safe place to sleep where he looked after a guy’s place while the guy worked overnight. Melckzedeck was always faithful to meet on time and obey instructions given that would help keep him safe while I looked for him a good place to stay. He even went to a certain church on Sundays by himself, where some people treated him really well and some didn’t unfortunately. Melckzedeck’s nickname is Bush. For a while in Kenya I had a cat named Bush. One night I had a dream that I was holding my cat, Bush, and brushing bread crumbs off of her unusually full belly while her tail wagged showing she was very happy. But she at the same time she had tears streaming down her cheeks as well. I figured that the Lord was talking to me about Melckzedek, and the next day as I was about to get off of the bus to meet him I told the Lord that I understand the bread crumbs, full belly and being happy, but asked what the tears meant. I spotted Melckzedeck right when I got off the bus and could tell that he was upset. Up close I could see that he had white tracks down his cheeks, evidence of some tears. When I asked him what was wrong he said that an askari, or security guard, had beaten him quite thoroughly. He had the wounds to prove it. He hadn’t done anything wrong, just was standing too close to the mall and the askari took that as opportunity to unleash some fury onto him, as commonly happens to the unprotected kids who live on the streets. They’re looked down on a lot and some people don’t want them too close to a nice place like the mall. I eventually learned that he did have a mom, who lived in the Kibera slum and a grandma as well. There had been some family problems that caused him to run away. We provided counseling for his mom and she improved greatly and was able to start working again. She now works in Saudi Arabia and he stays with his grandma and little brother. 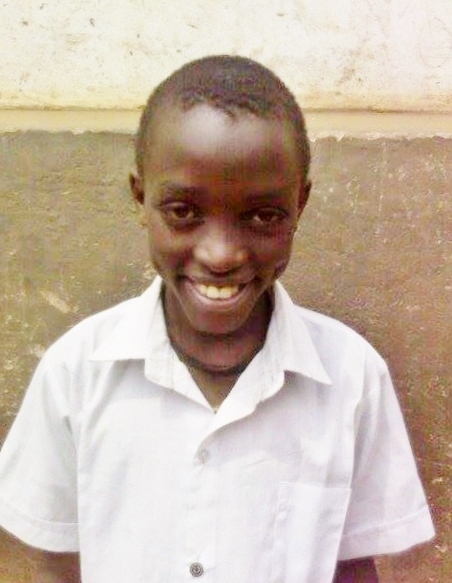 Sponsorship has enabled him to go to school and helps to feed him and his family. Last year he received Jesus as his Savior and is active in the youth group at our church. He’s also the prefect (leader) of his class now. Thank you so much for helping us do the important work of rescuing kids from the streets and transforming lives in Africa. You’re awesome. God is most awesome! If you’re interested in sponsoring a former street boy let us know, there are some waiting for a sponsor. God bless you. Melckzedeck doing a magic trick. Melckzedeck and an ndovu (elephant) at the grocery store.